In 1972 Tim Birkhead (now a professor at Sheffield University) came to Skomer to study the Guillemots (Uria aalge) for his doctoral studies. Back then the Guillemot population on Skomer had declined dramatically from around 100,000 pairs in the 1930s to just 2,000 pairs in the 1970s (likely due to oil spills during WWII). 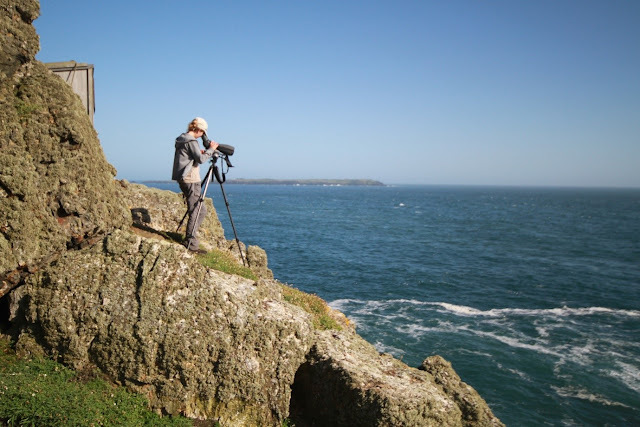 Tim initially set out to understand the dynamics of the declining Guillemot population on Skomer. Each year a Guillemot field worker arrives on Skomer in April to continue the project. These elusive creatures spend most of their time at the Amos in the company of around 2,500 Guillemots. The season begins with re-sighting of individually colour ringed Guillemots to enable estimates of annual survival. Then as breeding pairs start to form, a sample of around 100 breeding sites are mapped and their progress monitored throughout the season. This includes recording the timing of egg laying, chick hatching, fledging and breeding success. Now over 40 years later, and what started as a three year doctoral study has become an incredibly valuable long-term monitoring project. 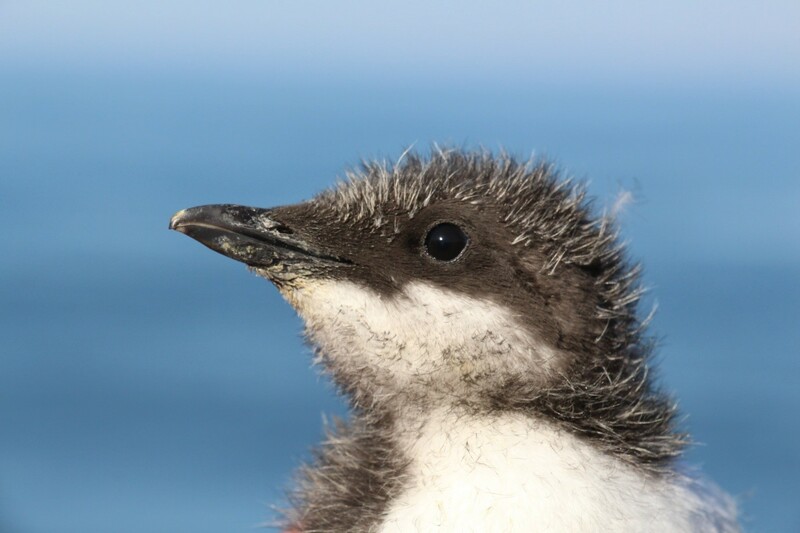 The Guillemot population on Skomer is now around 25,000 individuals and the main aims of the project are: 1) to understand the population biology of Guillemots and, 2) to provide a robust monitoring system to document population changes. Once the chicks have hatched their diet is recorded over a 13 day period by identifying fish in the adults’ bill before it is fed to a chick. 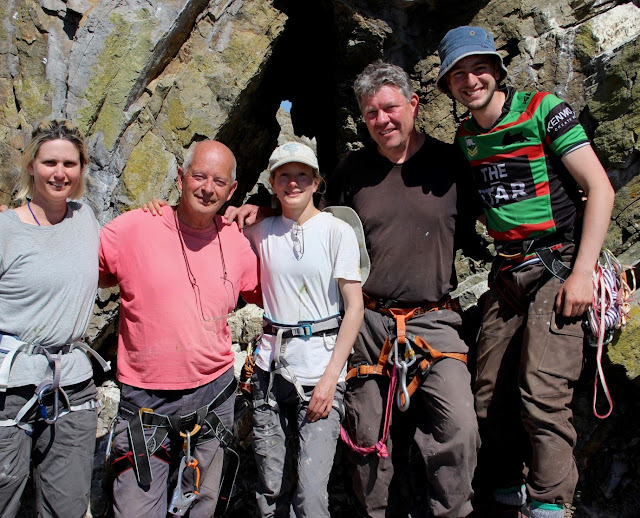 The grand finale of the season occurs in late June and involves the arrival of Tim, his ringing team and lots of climbing gear. 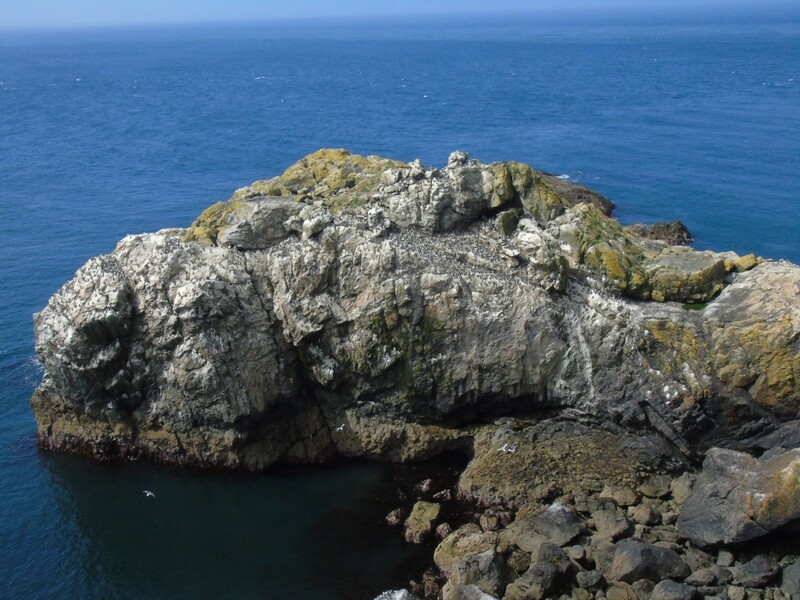 This means it’s time to abseil onto the Amos where we colour ring around 300 Guillemot chicks and collect fish samples. This year was a slow start with fog, wind and rain but gradually the Guillemots arrived and faithfully returned to their respective breeding ledges. The first egg of the season was seen on 1st May. When drawing comparisons we use the median lay date as this is a more accurate representation of what’s going on. This year the median lay date was 11th May which is 6 days later than in 2017. Often the first egg is an outlier and tends to be lost, however, this year it survived to yield the first chick which was seen on 31st May. The median hatch date was 13th June which is 7 days later than in 2017. In comparison to last year, chicks were fed more sprat and but fewer sandeels and Gadids (cod). This is a promising finding as sprats are a much higher quality prey. 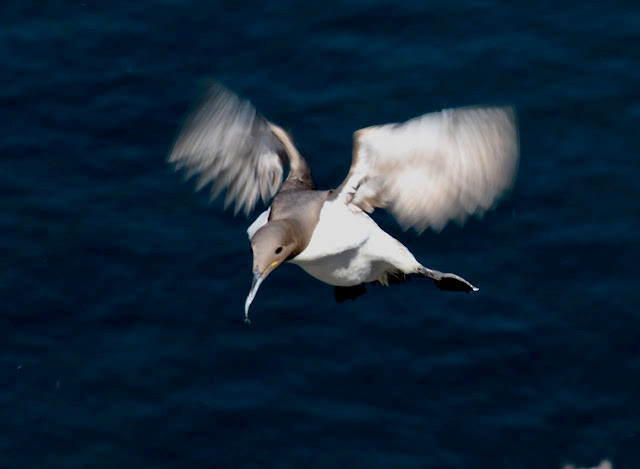 Long-term studies, like the Guillemot project, are highly valuable because they enable us to study individuals throughout their lifetime (the oldest Guillemot in the study is 33 years old) and investigate questions that weren’t even considered when the project started. Importantly, long-term studies enable us to investigate how populations respond to change before the change has occurred so we get the full picture.